An asset is any thing (physical or abstract) which can be of use. To be of use implies an entity capable of enjoying such use. I take an entity to be any living thing or any combination of such living things. The asset does not necessarily have to be in the ownership or the control of that entity. However, without ownership or control, the utility flowing from the asset is available diffusely to all entities and is not exclusive to a particular entity. An asset in the ownership of an entity is the property of that entity. (The sun could be considered an asset for all entities and not in the control of any entity and its benefits flow diffusely to all entities. A physical characteristic of an entity, such as strength, would be an asset available exclusively to that entity. A house may be an asset owned by an entity where the disposition of that asset and and all utility flowing from it are exclusively in the power of that entity). A revenue is an inward stream of utility, of usefulness, over time. The stream of utility is income only when it is in cash or in kind and is measurable and tradable. Something intangible could be revenue but, if not tradable, would not be income. (Revenue and income are like electricity and can only exist as a flow over time. They can accumulate over time as capital or assets and are analogous to an electric charge). Wealth and poverty are judgements. Wealth is always a surplus to requirements and thus relative to some norm of need. Similarly, poverty is then a deficiency also relative to some standard of need. Wealth and poverty can be applied to any tangible or intangible property or characteristic. 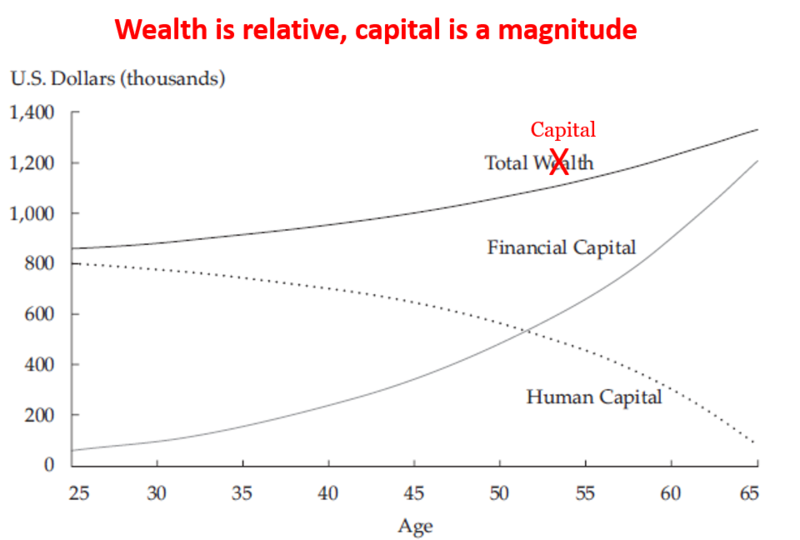 The magnitude of capital or of assets or of revenue or of income are not necessarily wealth or poverty. It is the judgement of whether something is in surplus or in deficiency which determines the existence of wealth or poverty. (Rich describes magnitude and richness may not necessarily be wealth. Similarly poor also describes magnitude and is not necessarily a judgement of a deficiency. Thus a rich man with much capital may be in poverty if his needs grossly exceed his capital. Or a poor man with little capital may be wealthy if it exceeds his needs. A surplus of an intangible asset – say some skill or happiness – is wealth but may not be capital. Rich and poor are magnitudes. Wealth and poverty are differences of magnitude). All wealth is not capital and all capital is not wealth. In the run-up to Davos, the headlines have been about 1% of the world’s population owning half the world’s wealth. (The Wealth “bible” is the Credit Suisse Wealth Report). The richest 80 people (0.1% of the 1%) have more wealth than the poorest half of the world’s population. Obama is talking about an additional tax on the wealthy. In his State of the Union address yesterday he declared that the economic crisis was over and about “spreading the wealth”. He prioritised the working families and the “middle class”. In Davos, 2,500 delegates arrived in 1,700 private jets. What constitutes wealth is a different matter, but no matter what definition is used, wealth is not something static. The “wealth of the world” is always changing. It is constantly being created and consumed and destroyed. The key point is not how much the rich have but whether the “poor” are increasing their creation of and their stock of wealth. And the simple fact is that the “poorer half” of the world has been steadily increasing its wealth creation and its wealth retention. 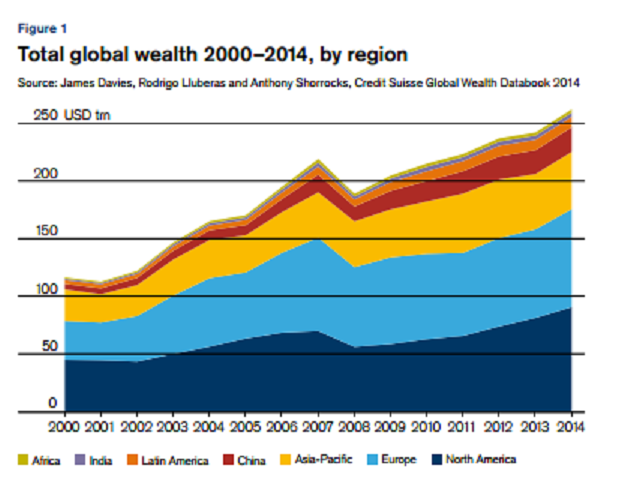 Between 2000 and 2014 the total stock of “wealth” in the world increased by over 250%! It is during periods of growth that inequality reduces and this is very striking when comparing the 2000-2007 period with the 2007-2014 period. Inequality trends for individual countries are explored in more detail in Table 2, with countries listed in order of the increase in inequality since 2000. The most striking feature is the contrast in experience before and after the financial crisis. In the period from 2000 to 2007, 12 countries saw a rise in inequality while 34 recorded a reduction. Between 2007 and 2014, the overall pattern reversed: wealth inequality rose in 35 countries and fell in only 11. The reason for this abrupt change is not well understood, but it is likely to be linked to the downward trend in the share of financial assets in the early years of this century, and the strong recovery in financial assets since 2007. The “poor” have to leave the ranks of the poor. They are not poor because the rich are rich – but because they do not have the opportunities to create and retain wealth. And that will only come in growing economies and not by increasing public expenditure where the emphasis is on consuming existing wealth rather than creating new wealth. Hans Rosling’s tour de force: 200 countries, 200 years, 4 minutes. This is not new and I think I first saw it about 3 years ago. But it is worth looking at not just for the content but also for the power of the presentation. Just a reminder that the world is feeding more people than ever before, we are living longer than ever before, and things are not as black as some alarmists would have us think. And by 2100 total population will be declining. The glass is more than half-full. A much longer (20 minutes) presentation is also well worth watching.